If you suspect you have been exposed to a significant amount of radiation, please contact a healthcare professional immediately. This post focuses on potential low dose nuclear radiation exposure. Many people have concerns about the Fukushima reactors and the nuclear emergency in Washington state. There are also threats of dirty bombs or other terrorist activities. We address the risks of radiation in homes, food and homesteads. 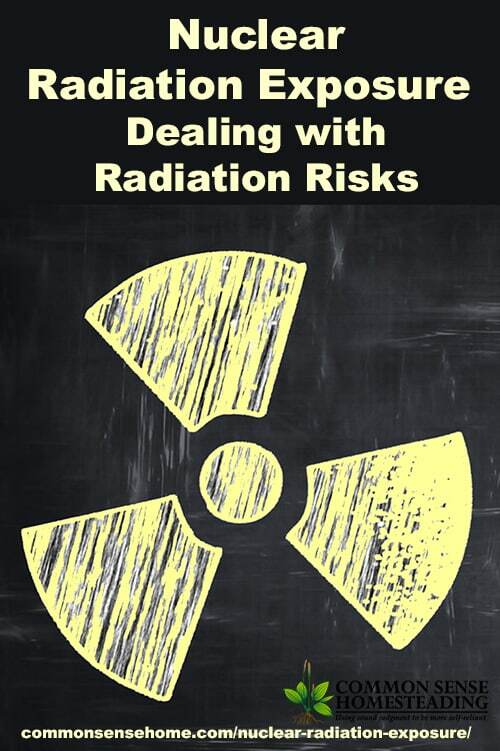 We'll discuss the most common radiation concerns, and steps you can take to deal with them. What can I do about radiation exposure? Potassium Iodide pills are only one of dozens of ways to help your body cope with radiation exposure. Please be aware that potassium iodide does have side effects and can interact with other medications. There are other methods for treating radiation exposure which may work just as well or better, especially if you have livestock to consider. The majority of Americans are iodine deficient, so we should be taking steps to add iodine rich food sources to our diets regardless of potential radiation exposure. I remember reading years ago about how miso soup and sea vegetables were used in the aftermath of the bombing of Nagasaki to treat radiation sickness. Real foods have the power to heal, and they can help protect and cleanse the system. “Sea vegetables” is another name for seaweeds, such as wakame, dulsi, kelp, kombu, hijiki, etc. WedMD notes that chlorella is taken orally to reduce radiation side effects. These are cabbage family plants such as broccoli, cabbage and mustard greens. The sulfur compounds in these vegetables trigger increase expression of your glutathione system, helping to detoxify heavy metals and bind free radicals. Whole grains bind minerals (including radioactive ones) and transport them out of the body. There is much anecdotal evidence that suggests kombucha aids healing from many toxins, as well as some scientific studies. In the article “Could Consuming This Mushroom Protect Against Radiation?”, Alexandra Preston notes fungi thriving in heavily irradiated areas. (This hasn't gone unnoticed by others. Mycoremediation uses mushrooms to clean up toxic waste and radiation.) She sites studies that indicate that indicate high melanin varieties of mushrooms may provide radiation protection. (Yes, this is the same melanin that gives your skin color.) Some mushroom varieties are also high in selenium, which is also protective. Simple home remedies for external use can help to pull toxins from the body. Baking soda baths and Epsom salt baths will help draw toxins out of your skin. Chlorella can be applied topically to treat rashes caused by radiation treatment. The burn aspect of radiation may be treated similarly to sunburn, with the application of aloe or other soothing creams. See Home Remedies for Sunburn for more suggestions. Again – Please see a trained healthcare professional in the case of significant radiation exposure. This post is for informational purposes only an is not meant to replace the care of a trained healthcare provider. What about radiation in the water supply? Water storage is critical. In the event of an emergency, it is common for water supplies to be disrupted. At a minimum, you should store one gallon per person per day. The minimum is to plan for at least 3-7 days. More is better, a LOT more. See “Emergency Water Storage and Filtration – What You Need to Know” for more information on water storage. Radiation is in the particulates, not the water itself. So the better the filter the more particulates you remove, the lower the radiation exposure you will have. To get radiation out of your water, look for a high quality filter such as reverse osmosis (RO) system or Berkey Filter. RO systems are commonly built into home water supplies. If the tap works, the filter works. Berkey filters are gravity driven – fill the reservoir and wait for it filter. Berkey did radiation filtering testing on their black Berkey filters. They found that they reduced both alpha and beta radiation contaminants and uranium by over 95%, meeting all EPA requirements for drinking water. See radiation filtering test results. Click here to Buy a Big Berkey Water Filter. What if there is Radiation in the Food? Possible residual surface radioactive contamination on food may be reduced by suitable food preparation such as washing, brushing, scrubbing, or peeling. It is also possible to store contaminated food for prolonged times to allow radioactive decay of short-lived radionuclides. On the contrary, cooking in general cannot reduce the level of radioactive contamination in food. You can wash off surface contamination, but there's no practical way to remove contamination from deep in the tissues. Avoid consuming contaminated food if possible. I have livestock or crops that have been exposed to radiation. What can I do to protect them, and is the food from them safe to eat? For livestock: Keep animals under cover if possible during times of radiation exposure. Keep their food covered as well. If food piles are stored outside and exposed to radioactive fallout, remove the surface layer of foodstuffs and feed material from underneath. If there is warning even throwing a tarp over exposed animal feed will help. If possible, supplement the animals with some of the same food materials recommended for human detoxification, such as sea vegetables. How do I know if I've been exposed to radiation? Can radiation get into my house? Radiation is detected using a radiation detector or dosimeter. You can purchase them online through a number of vendors. For older radiation detectors (like mine), there are companies that offer calibration services. Radiation is energy that comes from a source and travels through space and may be able to penetrate various materials. Light, radio, and microwaves are types of radiation that are called nonionizing. The kind of radiation discussed in this document is called ionizing radiation because it can produce charged particles (ions) in matter. Ionizing radiation is produced by unstable atoms. Unstable atoms differ from stable atoms because unstable atoms have an excess of energy or mass or both. Radiation can also be produced by high-voltage devices (e.g., x-ray machines). Unstable atoms are said to be radioactive. In order to reach stability, these atoms give off, or emit, the excess energy or mass. These emissions are called radiation. The kinds of radiation are electromagnetic (like light) and particulate (i.e., mass given off with the energy of motion). Gamma radiation and x rays are examples of electromagnetic radiation. Gamma radiation originates in the nucleus while x rays come from the electronic part of the atom. Beta and alpha radiation are examples of particulate radiation. 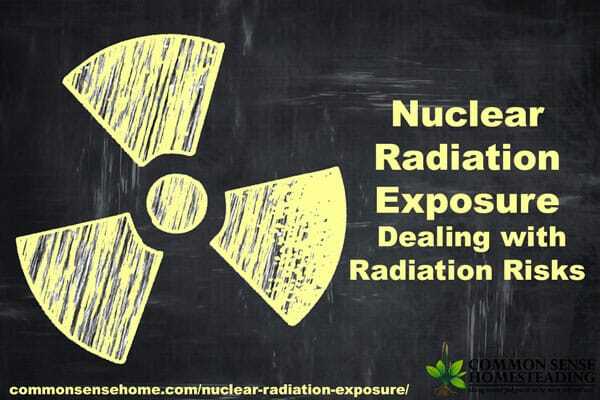 Interestingly, there is a “background” of natural radiation everywhere in our environment. It comes from spaaace (i.e., cosmic rays) and from naturally occurring radioactive materials contained in the earth and in living things. The document from the Massachusetts Department of Public Health states: “Alpha particles can be stopped by a sheet of paper. Beta particles can be stopped by a thin sheet of metal. Gamma rays are the most penetrating and can be stopped by concrete or lead.” This is yet another reason I'm thankful to live in a house built with Insulated Concrete Forms. In the event of a nuclear radiation emergency, most areas have some method of warning the effected populations. These include automated calling systems, warning sirens or announcements on TV or radio. 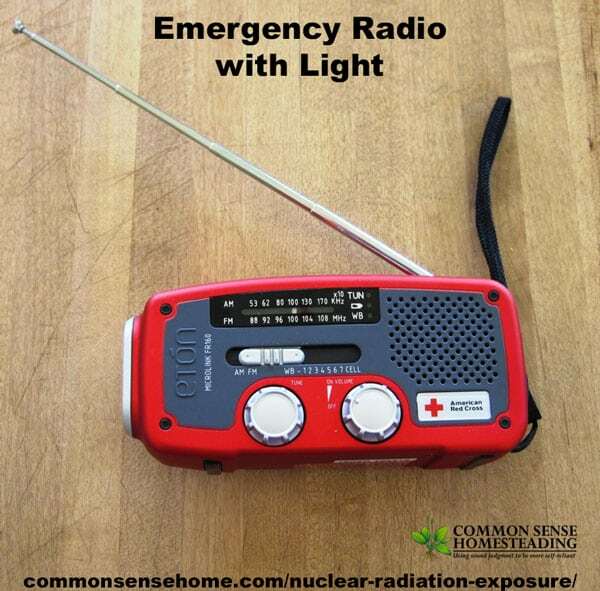 Include an emergency radio in your emergency preparedness kit so you receive announcements even during power outages. We were gifted one of these Eton American Red Cross units for Christmas by my in-laws. It includes a hand crank and solar panel for charging, along with an LED flashlight in addition to the radio. 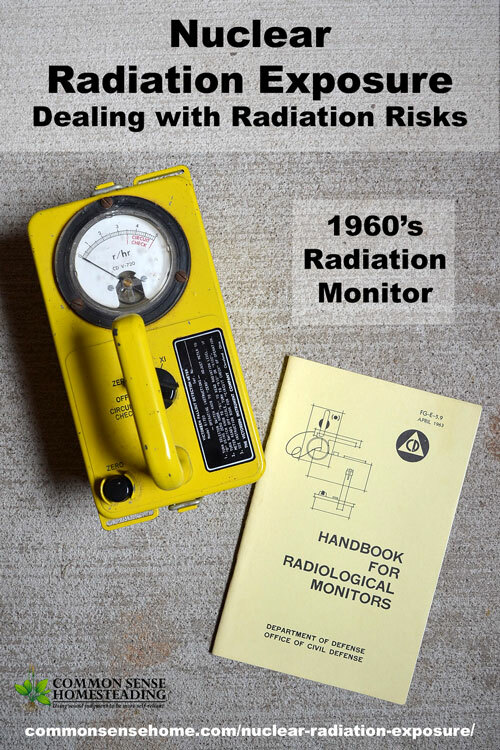 If you want to detect the level of radiation in an environment you can purchase a Geiger counter such as a Home grade dosimeter or RAD Triage single use. A professional one is quite expensive. What about the risk of terrorist attack using nuclear weapons or dirty bombs? It's an unfortunate fact that there are people out there who want to purposely hurt others. Risk of terrorist attacks are greatest in larger cities and coastal areas, due to the impact of devastating large numbers of people at one time and the accessibility of ports. A weapon could be detonated off the coast without reaching land and still wipe out a significant portion of the coastline. These two articles, one from the east coast and one from the west coast, discuss the risks of radiation based terrorist attacks, and what can be done about them. It is my hope that by understanding what can go wrong, we can all be prepared instead of panicked should a radiation emergency take place. Thanks for sharing this important information. There are so much fear mongering going on right now causing panic, so I have been ignoring a lot of articles. I know that particular site is prone to hyperbole. I'll try to address their concerns as well as I am able. #1 The Kyodo News Agency is reporting that radiation levels around the Fukushima nuclear facility are now up to 1,600 times the normal level. "Normal" levels are next to nothing – barely detectable – so this doesn't mean much. #2 According to The Daily Mail, 5 of the now famous "Fukushima 50" are believed to have already died. This, unfortunately, was to be expected. More will likely die. If you run into the heart of an inferno, it's just not survivable. A lot of firefighters/rescue workers died in 9/11, too. #3 Tokyo government officials have announced that radiation levels in Tokyo tap water are now so high that it is unsafe for infants to drink. In fact, CNN says that tests show that the amount of radioactive iodine in the water is twice what is considered safe for infants…. An RO unit will remove radiative particulates. #4 Elevated levels of radiation have been found in 11 different types of vegetables grown in the vicinity of the Fukushima nuclear complex. Again, expected. The blog post explains how best to deal with contaminated produce. #5 The government of Fukushima Prefecture is instructing residents that they should not eat any leafy vegetables that have been grown in the prefecture recently. This makes sense – you can't peel greens or otherwise easily remove their outer layers. They also tend to be quick growing, which means they would absorb toxins more rapidly and not have time to expels them before harvest. #6 Government officials have ordered all dairy farms within 18 miles of the Fukushima nuclear complex to suspend all shipments. Again, expected. Grazers would be exposed to radioactive particles via grass consumption, which could contaminate their milk. #7 Over 100 km south of Fukushima, Spinach containing radioactive iodine 27 times the legal limit has been discovered. The level of cesium found in the same spinach was 4 times the legal limit. #8 25 miles from the Fukushima complex, one batch of a leafy green vegetable known as kukitachin was recently discovered to contain 11 times the legal limit of radioactive iodine and 82 times the legal limit of cesium. See #5. Would like to see numbers on this. What is the legal limit? #9 The U.S. government has now put in place import alerts on milk products and fresh produce from any of the prefectures surrounding the Fukushima nuclear complex. #10 25 foreign embassies have already either shut down or moved temporarily out of Tokyo. A reasonable precaution. If evacuation becomes necessary, it makes sense to have what you can get done ahead of time done. #11 Radiation levels in one city north of Tokyo, Utsunomiya, were recently reported to be 33 times above normal levels. Numbers – numbers – would like some actual numbers. How much is "33 times above normal"? Yes, there are radiation concerns. Let's quantify it and tell people what to do about it. #12 It is also being reported that there were over 600,000 spent fuel rods stored at the Fukushima Dai-ichi complex. Each one of those 600,000 spent fuel rods is a potential "dirty bomb". And each one of those spent fuel rods represents fuel that could possibly be reprocessed at some point in the future to produce even more energy. Those rods represents years of power provided to millions of people. I'm hoping they continue to post these as the situation unfolds. As for whether or not the citizens of Tokyo should evacuate, I think the biggest question should be, "Where?" Where are you going to move over 12 million people to? (http://www.metro.tokyo.jp/ENGLISH/PROFILE/overview03.htm) sure, it might not be a bad idea to get out if you can, but I don't think it's a practical thing to relocate everyone. For better or worse, I think the best hope lies with those brave folks trying to get the reactors under control. Very interesting information – thanks for linking up to the Preparedness Challenge! Great information. I have been reading up on this. This is not something I had not prepared for before. Amy – Love your site. Thanks for taking time to visit and leave a comment. Carolyn – thank you. It wasn't something I had been overly concerned about before, either, but with all that's happened recently I think it pays to be prepared. Many of the treatments for exposure to radioactive material are also good overall detox treatments, sot hey are practical to keep on hand even in low risks areas. Do you have any info on the using baking soda baths and Epsom salt baths to draw toxins out of your skin? such as the amounts you need to add for them to be effective? I’m pretty sure that would depend on the duration and type of exposure, and would need to be determined on a case by case basis in conjunction with other treatments. The most common detox bath recipes call for one cup of sea salts, two cups of baking soda and one cup of Epsom salts. After mixing these ingredients well, you can store them in a glass jar with a screw-on lid. You only need about ¼ cup of the mix per bath so this recipe makes enough mix for about 16 baths. Excellent article! I really enjoy your blog posts and FB links–thanks. Laurie, Can you tell me about Zeolite and it’s use in this instance? And do you know anything about it’s regular use in detox. I know it’s not mentioned directly in your article, but I’ve heard it can be effective against radiation exposure as well. I’ve heard mixed things. Some sources say good and some say not so good (potential for it to contain aluminum). I did purchase some to try, but haven’t noticed any difference using it. I’d probably lean towards a different clay/mineral product, such as Bentonite clay. Magnesium supplements are also good for radiation toxicity. That’s interesting. Can you share more about how they help? Do they act as a chelating agent?